Need help with any aspect of your hosting? 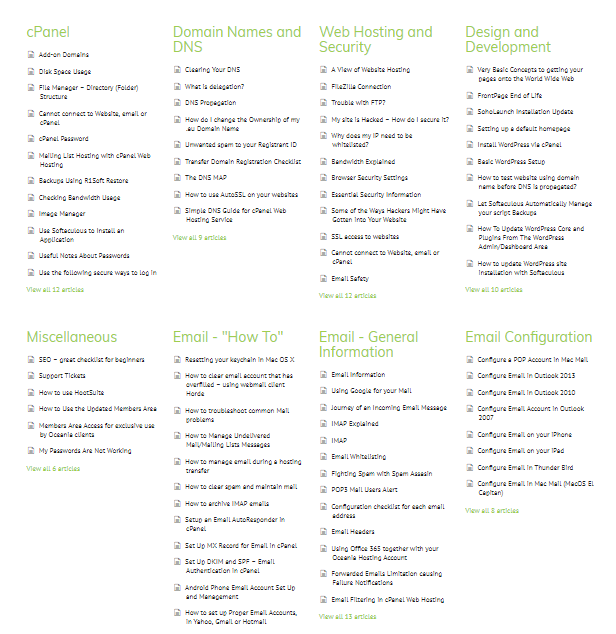 Would you like to learn more about what great tools are on board in your hosting account? Introducing the Oceania KnowledgeBase website – at your service. There are eight categories to help you browse swiftly to the section you need. Or if you prefer you can use the Search Bar. We recommend using a single word in the search bar for the best results. All articles can be downloaded as PDFs and our team regularly ensures that the content is up to date. If you still need help, contact us now – we are just a ticket or phone call away. Oceania has been providing web hosting services since 1999. We help you create a website that works for both you AND your visitors. All Australian Owned and Operated.